"The perfect addition to any tomato sauce." Toss bread crumbs, Romano cheese, garlic, parsley, black pepper, red pepper, and egg together in a bowl; mix in beef gently with your hands. Form beef mixture into meatballs roughly 1 1/4 inches in diameter; place on the prepared baking sheet. Bake in the preheated oven for 10 minutes; turn meatballs and bake until no longer pink at the center, about 5 minutes more. An instant-read thermometer inserted into the center should read at least 160 degrees F (70 degrees C). Made these with the ingredients as written. Cooked at a higher temp. (400 for 15 mins) They turned out wonderful. 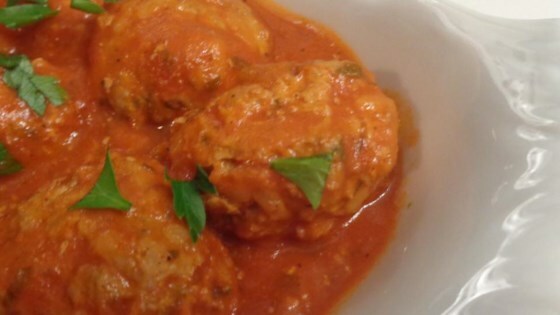 We are used to a more firm meatball so my family wasn’t sold on the texture, but the flavour was very good. Thanks for the recipe! Really loved these...I would just add salt to taste.